The cost range for a basic in-ground concrete pool is normally $35,000 to $60,000. We only recommend installing in-ground concrete pools for many reasons. The more add-ons and high-end options you want included, the higher the price will be. If you’re not looking for a basic pool, you could spend anywhere from $80,000 to $200,000 or more. Those are some pretty big price ranges, but like most projects, the cost depends on several different factors. Here are five components that will affect the cost of installing your pool. It’s pretty obvious a larger pool is going to cost more to install than a smaller one, since it will require more materials and time. But don’t forget about all of the components that affect the pool’s size. The pool’s depth is a contributor to its cost. Having a pool that is 5 feet at its deepest is pretty normal — since that’s the deepest people can stand — but anything more than that could cause the price to go up. You also need to think about the size, location and accessibility of where you want the pool installed. If you have a confined backyard that is hard to navigate or reach with large construction equipment, for example, that could increase the installation price. The soil conditions can all affect the cost. Some other contributing factors to the price include engineering, how the economy is doing, the pool company and a variety of other factors. Your pool contractor will not break down the different components that go into the final price. Yet, the sophisticated ones will speak with you about them. They should also talk to you about rough allowances or if they will be using subcontractors or if they do the work themselves. A typical mark up after costs for pool contractors is between 25% - 40%. Many factors affect the profitability of a project for a pool contractor. If you want the project to run smoothly, be understanding of change orders and time frames. Even the best and most experienced builders run into unexpected issues that impact cost or time allowances. The biggest cost driver when it comes to installing your pool is the type of finishes and edge detail you want. Some of the most popular finish options are materials like Diamond Brite, aggregate (like PebbleTec or PebbleSheen) and tile. The most common finish, plaster is the most inexpensive of the three material options. You can have colors mixed into the plaster to achieve the desired look. As plaster ages, it will need to be refinished to keep the pool in good condition and looking its best. Another popular option is an aggregate finish like PebbleTec or PebbleSheen, which is available in polished and exposed forms. Aggregates include colored or white plaster mixed with materials like granite, river stones, quartz or glass beads. This is a step up from the plaster cost and is also more resistant to chemicals and staining than just plaster alone. The third option, tile finishes give you a pretty unlimited design palette. You can just use tiles as accents on the waterline and stairs or throughout the entire pool. There are glass, porcelain, ceramic and stone tiles — and ceramic and porcelain options are the least expensive of the tile options. Make sure the manufacturer recommends the materials be used in a pool or submerged environment, and have the recommended setting material and grout in writing. Do you want a simple, rectangular pool, or do you want a custom shape, mosaic tile design, vanishing edge, planters, swim jets and floating spa? The more complex your project is, the more it will cost. It takes the designer and installation team more time to create a detailed pool — and time is money. If you can dream it up, we can do it: But it will cost more if it’s a tall order. Don’t forget to include add-on features from the start that will take your pool to another level. What you can add to your pool design is pretty limitless if you have the space and budget for it all. 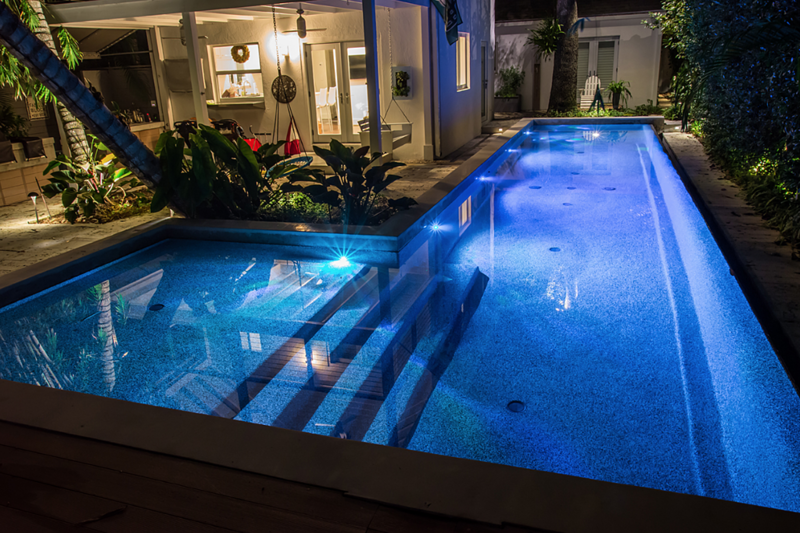 We design and install high-end pools, so the majority of our work is anything but basic. So if the cost of the pool is your only concern — instead of wanting a quality, piece-of-art water feature — Reef Tropical might not be for you. We create custom pools that make you want to sit back and relax with a cup of coffee as you gaze out at your own stunning art feature. But for those looking to add to their property’s value with a stunning pool or spa, reach out to us to find out exactly how much it will cost to install your luxurious pool. We will work with you through the entire process, including pricing, permitting, surveying, giving time frames, providing recommendations, selecting materials, installing the pool and everything in between. Our experienced team can also install landscaping features around your pool to complete your outdoor living space. 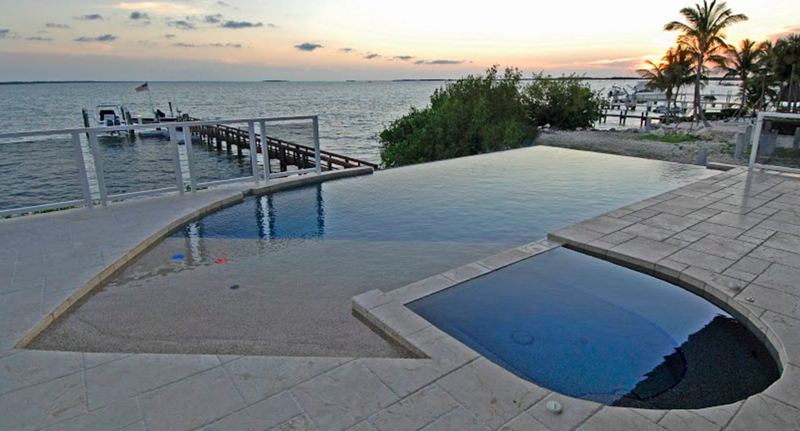 We install and maintain pools in Miami, the Upper Keys and throughout South Florida. Call us at 305-367-2005, or fill out a form online to see how much your dream pool will cost.